NEW! Valentina E. Marie Ensemble @ The Epiphany! NEW! 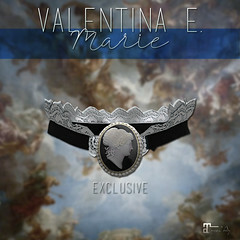 Valentina E. Marguerite Bikini @ Belle! Out now at Belle our new Valentina E. Marguerite Bikini in white eyelet and featuring jeweled daisy details. Available in four color options exclusively for Maitreya Lara only at this special event. NEW! Valentina E. Hera Scarf Dress @ FaMESHed! Out now at FaMESHed our new Valentina E. Hera Scarf Dress! Inspired by the iconic Hermès scarves, this pretty dress works perfectly with your Maitreya body undies or pair it with jeans or leggings! Available in four colors, exclusively for Maitreya Lara at FaMESHed. NEW! Valentina E. Kaia Dress @ UBER! Out now at UBER our new Valentina E. Kaia Dress! This beautiful silk dress features a draped top and pencil skirt. Available in four solid and four floral finishes, exclusively for Maitreya Lara. NEW! Valentina E. Rachel Maxi Dress @ Bloom! Out now at Bloom our new Valentina E. Rachel Maxi Dress! Featuring a bow tie waist and a thigh high slit. Available in three solid and three floral finishes, exclusively for Maitreya Lara. NEW! Valentina E. Daisy Dress @ Shiny Shabby! Out now at Shiny Shabby our new Valentina E. Daisy Dress! This pretty spring dress features a bow waist tie and ruffled details. Available in four seersucker and four daisy print finishes, exclusively for Maitreya Lara. NEW! Valentina E. Eren Separates @ Zodiac! Out now at Zodiac, our new Aries inspired Eren Separates! These modern and bold pieces are perfect for any occasion. Sold separately in four color options, exclusively for Maitreya Lara. NEW! Valentina E. Loren Dress @ Belle! Out now at Belle our new Valentina E. Loren Dress in ten finishes, exclusively for Maitreya Lara. NEW! Valentina E. Quaint Dress @ The Liaison Collaborative! 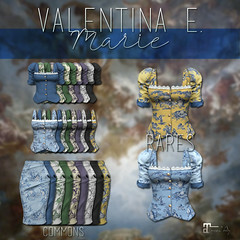 Out now at the anniversary round of The Liaison Collaborative is our new Valentina E. Quaint Dress! This vintage inspired piece features a high waist, pencil skirt, lace neck ruffle and cameo brooch. Available in four solid and four contrast finishes, exclusively for Maitreya Lara. NEW! Valentina E. Penelope Dress @ UBER! Out now at Uber our new Valentina E. Penelope Dress featuring a charming, vintage style with lace and pearl details. Available in four solid and four floral finishes, exclusively for Maitreya Lara.